Anderson Cooper is an American journalist, television personality, and author. 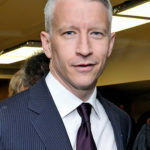 He is the primary anchor of the CNN news show Anderson Cooper 360°. The program is normally broadcast live from a New York City studio; however, Cooper often broadcasts live from CNN’s studios in Washington, D.C., or on location for breaking news stories. In addition, he is a major correspondent for 60 Minutes. "The whole celebrity culture thing – I’m fascinated by, and repelled by, and yet I end up knowing about it." "Anyone who says they’re not afraid at the time of a hurricane is either a fool or a liar, or a little bit of both."